Once again we thank Nathan Purkiss, and Carol Kirk for their excellent work. We also thank our Mogul backers for their excellent ideas. Special thanks to Joerden Leigh for the designs of Naught E, and Vixens, inc.
Last week we toured the North / West side of Old Bradford, exploring the Scholarton District, with its old buildings and architecture that survived the Fire of 1908. Today we will head to the North / East side into the New Bradford District. Here you will find a very different style of architecture and ‘vibe’ happening in the streets from what you saw in Scholarton. Like many great old cities, modern architecture has sprung up next to buildings that have been there for generations, sometimes reflecting older styles and sometimes standing in stark contrast. But whether excessive or architecturally striking, in Titan City, many modern buildings will especially have the character of being fortresses where heroes and villains take refuge. Several mogul concepts shared by participants in our Kickstarter campaign make a great fit with the modern architectural spirit of this neighborhood and will be placed there. 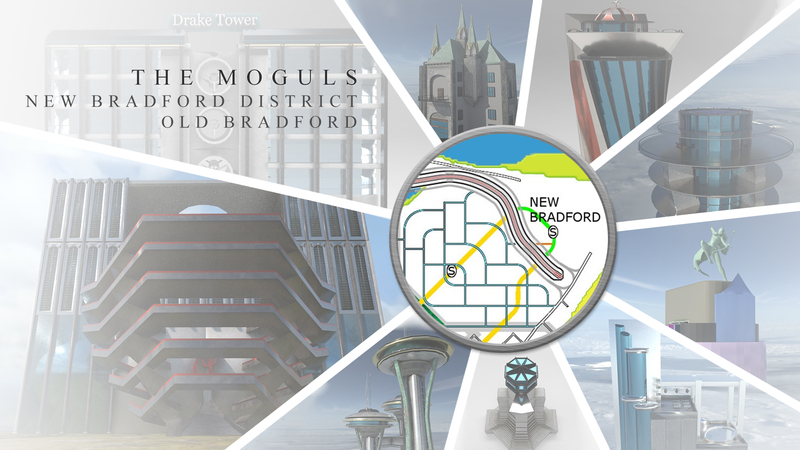 The map above shows the general area of where the following moguls will be placed - in New Bradford. This concrete structure is the home of Fury Inc., private security providers for mercenary teams and covert ops of any size. Flying above you can see it’s an octagonal building layered incrementally with a small "pyramid" at the top that contains a private penthouse. One front of the building has an arch shape to the top where mercenary teams and covert ops can be seen flying out of the building. On another front, the Fury logo is placed at the top of the building with its tiger’s head and advanced-tech weapons making an x-cross beneath. Given its unique architecture and private security services offered, the Fury building is one of the interesting sights in town to stop and check out. Some of the skyscrapers built mid-century in New Bradford were designed to look like pre-1908 buildings (the older architecture found in places like Scholarton that were built before the great fire). Ciela Tower is a great example of that style. Its old fashioned balcony near gothic spires, while not as tall as some of the newer buildings, still has one of the best views of Titan City. Continuing our stroll through on the North / East side of Old Bradford we find an unabashedly modern structure: Blue Battletower. The official certification of the Titan City Recorder’s Office states that Blue Battletower is an “office building”. Anyone passing by the structure can see that this unique piece of Titan City architecture has many mysteries beneath its deep blue structure. It hosts a helicopter port on top and flying heroes can often be seen entering and exiting the building on their way to solve critical missions for the City - stop and ask one of them if you would like to learn more about the Tower. Cosmic Exploration Technologies, Inc. is a modern building with bending architecture like Cayan-Tower in Dubai, but with a cosmic landing port at the top that reminds some heroes and villains of 1950’s space-age modernism. One of the tallest buildings in the New Bradford area, it stands out for its very unique look. The types of cosmic weaponry and innovations being explored within the building are a total mystery to many Titan City residents, but if you catch one of the tech-armored residents flying out the landing port, they may fill you in about what’s going on inside…. At some point tech warriors need to enjoy some down-time, and there is no more luxurious spot to do it than the Naught E Corner. With its’ rooftop pool and jacuzzi, and several floors for dancing, Naught E is Titan City’s most opulent disco. We shared the Naught E Corner with you in January’s mogul update, but wanted to include it in this tour of Old Bradford so you will know how to find it for your late-night bubbly and dance party needs! Another space age, futuristic building you will find in New Bradford is the Argus Enterprises building. Known especially for its imposing entryway that makes the building look like it has giant tech teeth, Argus Enterprises also has many circular holes at the top side of the structure. Drake Tower has the distinction of being the most energy-efficient building in Titan City. A LEED Platinum building with the highest of environmentally sustainable standards, Drake Tower is highly efficient, with solar panels at its rooftop and wind turbines at the building’s center to offset energy usage for all of its super-powered technological needs. While not the tallest building in New Bradford, you can still get a sense of its significant height if you follow one of Drake’s inhabitants up the extraordinarily tall fire escape ladder that services all of the building’s wind turbines. Heading towards Victory Beach in New Bradford stands a mid-century relic that brings back memories of the Old Titan City boardwalk – the Sky Drop airborne lounge. Considered one of the most futuristic buildings in Titan City during its heyday, it fell into disrepair over the years and was nearly demolished at several points in its history with the City. Fortunately, a private investor paid for needed upgrades and today the Sky Drop is a fun retro-lounge to enjoy a break from super battles with a refreshing drink in the clouds. The entrance to the Sky Drop is at the front of its central, tallest structure, but all three of its lounges in the sky can be accessed through the sky bridge that connects the structures. This old jellyfish scene by the sea is a VIP lounge run by its private benefactor, so you'll need to ask someone at the entrance for access. Mogul #9 - Vixens Inc. Continuing the tour closer to the New Bradford subway station is a striking building - Vixen’s Inc.
Titan City enjoys a rich and engrossing history. It shines as a beacon of hope and opportunity to those who seek justice, a magnet for those who want to make themselves rich and famous - an irresistible lure to those who would do evil! Vixen’s Incorporated is an iconic Titan City skyscraper that represents very special features of the City’s history. The art design was conceived by famous artist Joerden Leigh, a founding architect of the city, with a unique modern design, vibrant colors, and dynamic heroine archer featured at the top of the structure. The Vixens building is a beautiful site to land at and take a break in gardens that rest on top of the world. It was designed to embody resilience for a City that wouldn’t give up, representing the years of passion devoted to a community of heroes who always continue the fight. Next Week we will continue our stroll through Old Bradford visiting newly-made models of other moguls in the neighborhood, heading into some of the bohemian parts of town, including Firetown, the Park District and the Theater District!